China alone had approximately 60.74 million international tourist arrivals in 2017. And it’s no wonder! Asia has always attracted people with its architecture, nature, and culture. You feel like you’re in a totally different world where you can sometimes even lose yourself. We at Bright Side are inspired by Asia and would like to share our experience with you. There is a useful bonus for you at the end of the article about some inventions that you may need while you’re in Asia. There are some time zone exceptions that might surprise us. It might be difficult to accept, but there is only one time zone in China, although geographically this country is huge and could include 5 zones. There is only Beijing time in China! There are some secrets to staying young that are known only in Asia. Just have a look at these people! They look like they are at most, 25 years old. But actually Lure Hsu is 43 and Chuando Tan is 52. There are miracles of modern architecture in Asia. One of these miracles is the “White Temple” in Thailand. This unique art exhibit belongs to Chalermchai Kositpipat, who designed, constructed, and opened it in 1997. When you visit it, you feel like you are transported inside an Asian fairy tale! It is mostly white and this gives you the perception of weightlessness. If you want to feel like the hero of an Asian movie, here is the place to do it. There is a parallel universe that can transfer you to the Avatar world. There is a special attitude toward cleanliness in Asia. There are different rules that govern cleanliness and order in Asia. As proof, there are even special shoes for the toilet. Maybe at first this might seem useless, but those slippers are used to minimize the contact between an unclean bathroom floor and the clean floor in the rest of the apartment. There is a teeth blackening tradition in some Asian countries. There are places where you feel like you’re in the future. There is a huge system of fines in some Asian countries. Singapore might be one of the cleanest and most organized places, where people’s behavior is based on a great respect for their fellow humans. But this environment is also connected with an intricate system of rules and fines. If you don’t follow the rules, like the ban on chewing gum, you might be slapped with a huge fine of $500, or even $1000. It’s normal to sleep everywhere, even at work. There is a huge desire to be the best at everything in Asia. There is a toilet topic that is very popular in Asia. In Asia, you can have some of the most unusual and bizarre experiences. To satisfy your extreme experience urges, you just need to come to Asia, because there is a huge amount of unorthodox activities available. Like SkyCycle in the Philippines. Your bike is on a cable that is 60 ft high and you cycle a 200 m distance up in the sky. Or you can go to Huashan Mountain to have an unforgettable experience by climbing the Path of Death. There you can touch the clouds and see unbelievable and breathtaking views. Asian companies created the urban transport system of the future and totally got ahead of themselves. Toyota i-Road “combines the potential of both cars and motorcycles.” This is the future of urban transportation that can make life easier and faster. With this new generation transport you can travel 50 km without charging your vehicle. 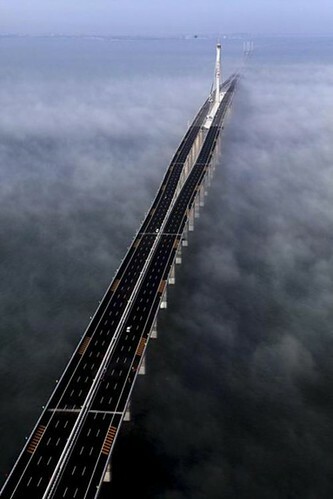 One of the longest bridges in the world is in Asia. The sloth bear is an insectivorous bear that exists only in Asia. What Asian things or customs inspire you? Please, tell us your opinion! And don’t forget to share this article with friends.